One of the most fun things to do with your iPhone is record all of those unforgettable moments by snapping some quality photos. You can view your photos in logical categories, such as by date or a location where they were taken. These so-called smart groupings let you, for example, view all photos taken this year or all the photos from your summer vacation. 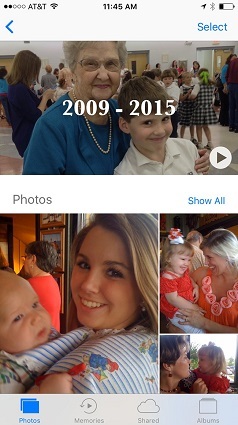 Tap Photos on the Home screen to open the Photos app. Tap Photos at the bottom of the screen on the left. 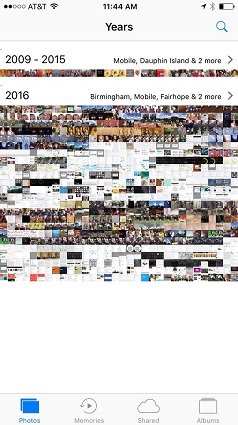 The display of photos by date appears. Tap a year or years on the left; you see collections of photos by location and date. Tap a collection and you can view the individual “moments” in that collection by category, such as Groups & People, Places, Related, and more. To go back to larger groupings, such as from a moment in a collection to the larger collection to the entire last year, just keep tapping the Back button at the top left of the screen.